You don’t have to break the bank in order to get some serious sound pumping out of your computer’s speakers. Instead, you’ll just need to make sure that you know what to look for. If you’ve been looking for the best computer speakers under 50, then you’re in for a treat. This is one of our reviewer’s favorites, coming in well under the $50 mark at the time of this review and being easy to use and versatile. It’s just enhanced by the fact that they’ll run at 30W RMS and has a 5.25” subwoofer. This set also comes with a handy desktop button which will let you control everything no matter where you have the speakers placed. This button also has an auxiliary port for your headphones if you don’t want to wake up the house. Unfortunately, the subwoofer doesn’t seem to kick quite as much as the size would indicate. That’s a big downer for those who enjoy their dubstep, but it’s not too big of a deal for the average person. 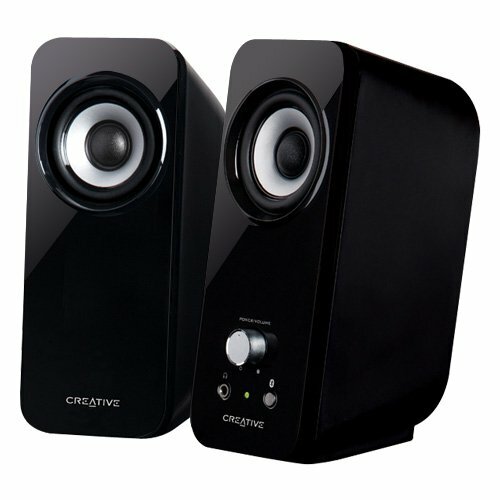 Overall, this is a great set if you’re looking for conventional speakers and are limited to less than $50. One of the priciest options on our list of budget speakers, most of our reviewers favored the Logitech Z323 over the majority of products we took a closer look at. There’s also a Bluetooth option available for these speakers, but it’ll push it a bit above our target price range. While you shouldn’t expect true audiophile quality from these, they have a clear and crisp sound in the highs and mids. As expected, the bass falls somewhat short but it’s definitely powerful enough to have real presence. The biggest problem with them is that they lack portability. Due to some kind of engineering SNAFU the wires for this speaker system have to be placed quite carefully to avoid any static hissing, once you’ve got them there though you’ll find it well worth the price. If you’ve got a bit of a higher budget, then you should take a closer look at this set. It’s pretty much perfect for the vast majority of desktop users as long as you’re not planning on moving the set frequently. Multiple driver speakers are pretty rare when it comes to computer speakers, and even rarer at this price point. That’s enough to recommend the INSMART Desktop Speakers, particularly if you’re a big fan of retro-styling. While the subwoofers are fairly small, having two dedicated unit gives you much better low ends than you’d normally be able to get at this price. 2-way speakers are really the best way to get clear sound since you’ll have a dedicated speaker for both the highs/mids and the bass. Our reviewers seemed to think the wood made a difference as well, but that might be entirely subjective. If you’re looking for a set of retro computer speakers, this set from INSMART is available at a great price, is 2-way, and will allow you to get better sound than you have any rights to at this price point. This ELEGIANT soundbar is on the higher end of our price range, but it also produces great quality sound and connects wirelessly to save you the hassle of wires. The biggest problem here is the volume. With only a 10W RMS rating you’re not going to get a ton of booming sound coming forth. 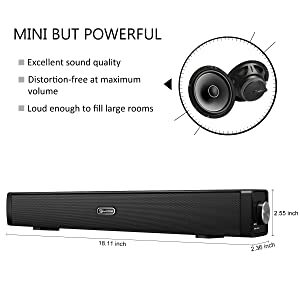 This makes their advertising a little bit deceptive, but for computer speakers, they’re a solid option. Above all, you’ll be able to get some high clarity. Lacking a subwoofer, like most sound bars, you’re not going to be able to get booming bass but the rest of the spectrum comes through crystal clear. Add in the easy to use side knob and the low profile and you can easily see why this bar made our list. It is a bit big for laptop usage, however. 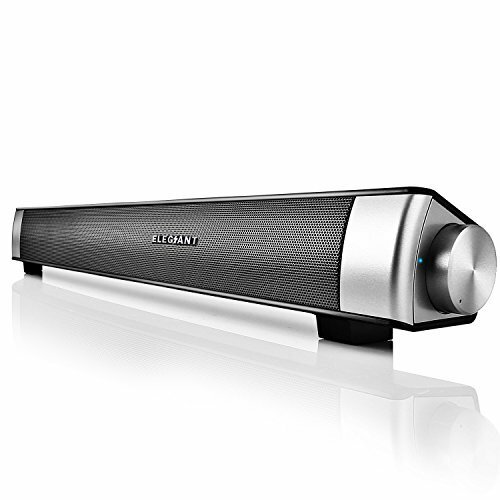 If you’re looking for a clear sound on a tight budget, then you may want to take a look at this Bluetooth soundbar. 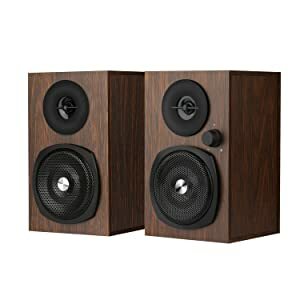 With tiny satellites, pseudo-wooden styling, and a decent subwoofer this 2.1 set of computer speakers is the best option for those on a hyper-tight budget. Even better, the tiny subwoofer and small satellites make for easy desk placement. The main thing that our reviewers noted is that they require quite a bit of equalization in order to tease the best sound out of them. With a little bit of know-how though we found they could compete with some of the more expensive options on our list. Our biggest problem with them was the fact that there’s no remote and the controls are a bit hard to access. If you’re willing to make sure you’ve got the software this might be the best price-to-quality ratio on our list, however. If you’re looking for a cheap 2.1 set with an impressive end-performance, then you should snap these up. If you can’t work with audio software, however, you may want to give them a pass and spend some extra money on an easier to tune setup. If you’re looking for a soundbar to put in a tight place, then the EIVOTOR 18” Sound Bar makes a lot of sense. While it lacks some of the features found in other bars at a similar price point, the small size means it’ll fit anywhere. It’s not super loud, and you’ll have to keep it plugged in, but for laptop usage, it’s a great idea. It’s particularly a good buy if you’re only planning on using it at home. The main draw is their small size, but it’s a perfectly serviceable speaker for the most part. Audiophiles may want to give it a pass, but the rest of us will love the small size and easy controls. If you’re looking for the right sound bar for a small desk, take a closer look at this 18” option. These tiny speakers pack a big punch, and they’re also cheap enough to fit into nearly any budget. If you’re planning on taking your computer on-the-go, then you’ll be right at home with these. The plug-in scheme takes a few ports on your computer, coming in the auxiliary port and being powered by your USB. That’s a small price to pay, however, considering they’re only 3.7” high and about 6” long. They provide a pretty impressive clarity of sound for the miniature design, but you’ll want to be a bit careful with the wires. Some of our reviewers noted they’re quite fragile, so placing a small spring over the end of the connection or using an auxiliary-to-USB adapter can help prolong their life. 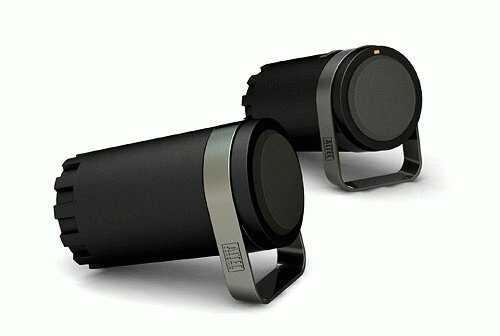 For a cheap pair of miniature speakers, you’re sure to be impressed with the Altec Lansing BXR1220. Just make sure to take adequate precautions if you’re going to be moving them around a lot. If conventional, two-channel speakers are your gig then you’ll be quite happy with the Inspire T12 set. Their Bass Flex technology adds a little bit of lower frequency without forcing you to make room for a subwoofer. Of the budget computer speakers, we reviewed for this article they’re also the most stylish. They won’t look out of place on a modern desk, although they’re a little bit bigger than most of our favorites. They’re pretty simple apart from the clear sound and touch of bass, which really is for the better since computer speakers can be equalized readily with the right software. The biggest issue is the volume controls. At the lower end of things, you have an inaudible mess, at the higher end of things you’ll get some massive distortion. They run best between ~30% and ~70%. For clear sound in a conventional package, the Creative Inspire T12 is the way to go. They’ll take up a bit of space, so they’re best for desktops, but they offer a complete package for a remarkable price. For the best of the bottom of the barrel, the Logitech S150 put up a good fight. Don’t t expect them to work miracles, but they’ve got a rock-bottom price and decent overall sound. They’re pretty bare-bones as far as features go, but everything really necessary is present. They’ll let you know when they’re on with an LED, they’ve got an easy to control volume knob, and they connect to a USB port. The biggest thing lacking here is a headphone port. The lack of an actual auxiliary connection can also be problematic if you’ve got a lot of accessories on your computer as well. 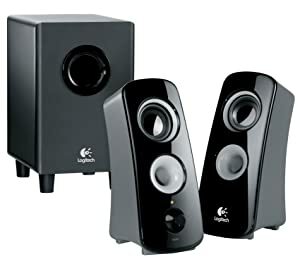 You certainly can’t have everything at this price, but if you’re just looking to make sure you’re able to get some sound with your computer then you can’t go wrong with the Logitech S150 USB Speakers. When you’re looking to equip an office, the primary concern is always going to be finding something which is “good enough” but can also be bought for cheap. 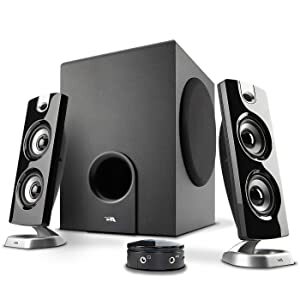 We think there are better speakers for only a couple of dollars more, but this reliable and cheap set is a good way to outfit multiple computers. The best part of the CA-2014 is their simplicity. 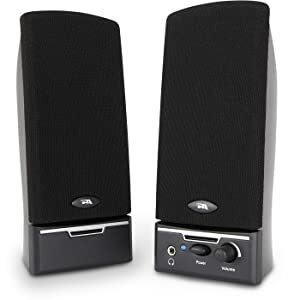 They’ve got just what you need, they push clear sound without any messing around, and they’re good through most of their volume range without distortion. They’re also plug-and-play and pretty much hassle-free. On the other side of things… this is still a really cheap set of speakers. They’re usable for voice chat, but you’re not going to be pushing amazing quality music through them or anything. Overall, we like these for people who just want to buy multiple pairs, but for the home consumer, they’re not the best option. Most of us make do with integrated speakers these days. About as far as people reach is for Bluetooth speakers for their laptops or phones. After all, desktops are a thing of the past for many people. That’s not always a correct assumption. Many households still enjoy their desktop computers, particularly those homes which house gamers. Since you won’t have access to integrated speakers, in that case, it makes sense to look for something cheap and functional. The biggest problem most people run into is this: speaker specifications aren’t all that obvious to those who haven’t invested their time in researching them. Technical specifications are the best guideline for purchasing your speakers. Let’s dive in, you’ll want to know the following about any set of speakers you’re seriously considering as a home addition. Any set of computer speakers is going to have a number attached to them. These numbers give you a good overview of what you’re looking at without even seeing the speakers in question. The numbers are pretty easy to decipher: they’re a function of the number of speakers plus the subwoofer. The most common speaker sets for computers are 2.0, but if you’re looking for something to add a little bit of bass to your life then you’ll want a 2.1 set. 5.1 sets tend to be quite a bit more expensive, and thanks to advancements in speaker technology they’re also unnecessary for anything but those who really want surround sound for their desktop. Power for speakers is measured in watts. Unfortunately, with many smaller speakers like those used for desktops, it can be hard to find a wattage rating. The takeaway is this: if you see a wattage rating for the computer speakers you’re looking at, they’re bound to be of higher quality than those which don’t give you the information. Higher power ratings don’t just mean that you’ll be able to get a louder sound. The RMS rating tells you how much power the speakers can maintain a clear sound at. If you regularly have speaker distortions at higher volumes, then you’re running the risk of blowing a speaker out. Of course, chances are that you’re not building a home set of speakers to attach to your computer, instead, you’re looking for something convenient that’ll deliver a decent amount of sound. The convenience factor really can’t be outweighed. They’re the primary reason which speakers are developed for a computer after all. You’ll also want to consider the following qualities to make sure you get the right set of speakers. These are the most common type of speakers available. 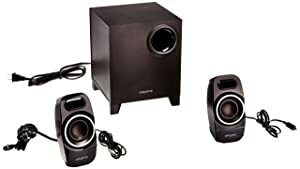 You’ll usually have two speakers, one to sit on each side of your monitor in order to deliver stereo sound. For most people, the size is going to be a big factor. No one wants to deal with gigantic stand-up speakers for their computer unless it’s a designated audio station. If that’s the case, you may want to look for stand-up speakers instead. The footprint is the biggest consideration if you’ve got limited desk space or you’re planning on using them with a laptop while you’re on the go. For most desks, a subwoofer is going to end up under your feet since they’re generally not small enough to fit on any normal-sized furniture. If you do have the room but aren’t willing to spend the money on serious equipment, you may be better served with converting bookshelf speakers for computer usage. There are also miniature speakers which are made precisely to allow you to get sound without having to take up a ton of space on the desk. For our purposes, we’d consider anything which is under 2”x3” miniature, but the best of these are able to clip on to a flat-screen monitor or laptop display. These are usually the best type for those who are planning on moving their computer around a lot. They don’t deliver a ton of sound, however, so the extra cost may not be worth it for a stationary computer. Sound bars are relatively new to the market, but they allow you to have all of your speakers held together in a single convenient package with a sleek design. For computers, they come in both clip-on varieties and the sort of thing that you’ll be able to slide under your display depending on your tastes. They’re pretty convenient for that sort of thing, but they do come with some problems. The biggest concern for most consumers is that they purport to have “surround sound” but a real surround sound set is… well, they’re simply better overall by a wide margin. For computers, however, true surround sound is rarely a concern and they make a sleek option to keep your desk organized. For laptops, seriously consider miniature speakers or a clip-on sound bar to allow you to remain mobile without having to resort to subpar laptop speakers. For desktops where sound quality isn’t the highest concern, go with a sound bar in order to save space on your desk, usually, you can place them right on your monitor stand underneath the screen. If you’re really looking to enjoy music on a budget with your computer, then pick up a 2.1 set. Just make sure that you have the right place for your subwoofer for the best results. So, without further ado, let’s take a look at the different speakers which are available for your computer. While you may be able to find better speakers, all of these are suitable for someone on just about any budget. We hope that you’re pleased with our choices, we extended a considerable amount of testing and research into bringing you only the best computer speakers under $50. There are certainly better options out there for sound clarity but it’s always hard to pass up a bargain. Snap up the one which suits you best and you’ll be surprised with the outcome. 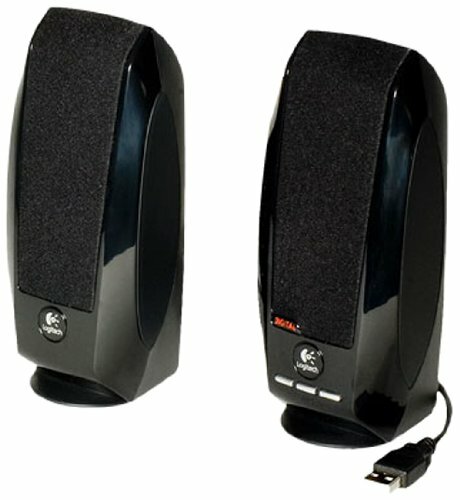 If you’re having trouble deciding, then get the Cyber Acoustics 2.1 Computer Speaker with Subwoofer. It’s a solid choice, comes with a subwoofer, and makes the perfect companion for at home listening.